Verv high energy gamma ray sources discovered by H.E.S.S., as shown by TeVCat. The yellow circle indicates the two nearby active galactic nuclei Centaurus A and 1ES 1312−423, the colored area shows the part of the sky well observable by H.E.S.S. The top image illustrates the very high energy gamma ray sources discovered with H.E.S.S. to date - 84 sources in total, as listed by TeVCat, about 3/4 of which are located in our Galaxy. While sources pile up along the band of the Milky Way, and is quite common to see in the Galaxy multiple gamma ray sources in the 5 degree field of view of the H.E.S.S. telescopes, extragalactic sources are distributed sparsely across the sky, and it is quite rare to have more than one source in a field of view. One of those exceptions is the field indicated by the yellow circle, containing the radio galaxy Centaurus A detected by HESS (see SOM April 2009), and the active galactic nucleus (AGN) 1ES 1312−423. Between 2004 and 2010, H.E.S.S. carried out deep exposures of Centaurus A, accumulating well over 100 h of observation time. Apart from gamma ray emission from Centaurus A, a second source emerged at the edge of the field of view, about 2 degrees from Centaurus A, see Fig. 1 and Fig. 2. Based on its location, the source is identified as the AGN 1ES 1312−423, which was initially detected in X-rays by the Einstein observatory (Gioia et al. 1990), and was further observed in radio and extracted from optical sky surveys by Stocke et al. (1991) who classified it as a radio-loud AGN of the BL Lac class. Stecker et al. (1996) proposed this low redshift BL Lac object (z = 0.105) as a potential very high energy gamma ray emitter, though with a very faint predicted flux of 0.7% of the Crab nebula flux. The low predicted flux level of this AGN did not motivate a dedicated observation campaign by H.E.S.S., but the extensive H.E.S.S. observation campaign on Centaurus A successfully enabled its discovery as a weak source, at a flux level roughly consistent with the prediction, but only brought to light - especially given its position at the edge of this field of view - with the development of advanced analysis techniques. A publication giving more details including a wide-band spectral energy distribution is in preparation; 1ES 1312−423 shows the double-humped energy output common for active galaxies, with a first peak of non-thermal emission in the X-ray range - presumably due to synchrotron emission, and a second peak at the cross-over between the Fermi and H.E.S.S. energy ranges, due to inverse Compton scattering. Fig. 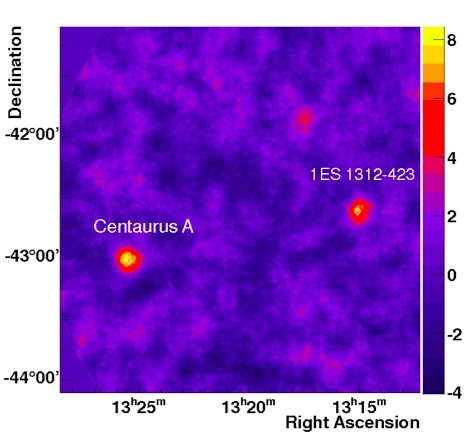 1: Significance map of very high energy gamma ray emission for the Centaurus A field. 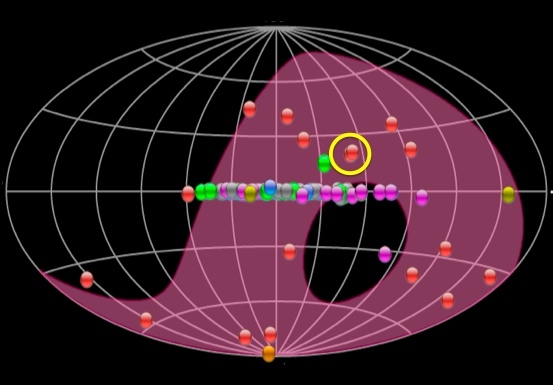 The yellow diamonds indicate the radio positions of 1ES 1312−423 and Centaurus A. 1ES 1312−423 is detected with ~6 sigma signficance. Fig. 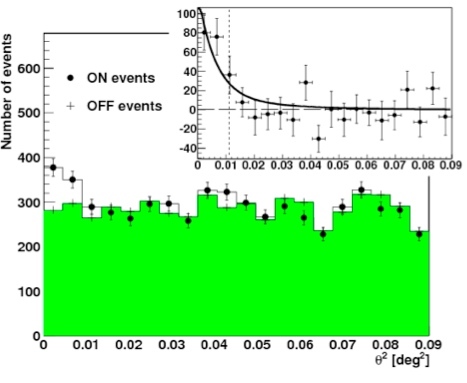 2: The distribution of the squared angular distance between the source position and the reconstructed gamma-ray direction for ON-source events (black points) and normalized OFF-source events (green shaded area), providing a background estimate. In the inset: background-subtracted distribution of the squared angular distance, representing the 154 excess events. The superposed line indicates the point spread function of the instrument; the excess from the direction of 1ES 1312−423 is consistent with a point source of gamma rays.